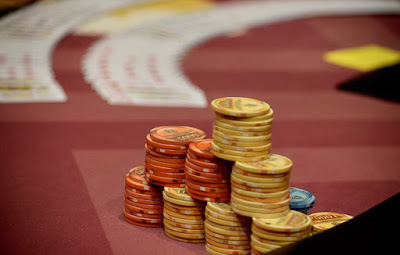 The final 31 players in #TVWSOPCircuit $898,500 Main Event are just about finished with their hour-long dinner break. Hafiz Khan - as he's done since the first hand of play today - holds the chiplead at 1,135,000, the only player with a 7-figure stack. Roland Shen (939,000) and Elisa Nakagawa (850,000) hold the Nos 2-3 spots. Play is scheduled to make it down to the final table of 9 tonight, with play scheduled to resume Monday at noon for the final table. Here's the final 31, by table, in seat position order, with pretty close to semi-official chipcounts included.